Lutz Schubert studied computer science and philosophy at the University of Stuttgart. Since 2004 he is working at the High Performance Computing Centre Stuttgart (HLRS), where he held a position as head of the Intelligent Service Infrastructure (ISIS) research department until 2013. The ISIS research department focused on efficient management and programmability of large scale heterogeneous computing environments. As of May 2013, Lutz Schubert joined the University of Ulm as the head of department of the Institute for Information Resource Management. 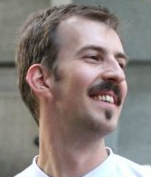 He is actively working on distributed systems related research in renowned national and international research teams. As such he has participated in shaping the Grid concepts, later Web Services and now Cloud Computing. His specific research focus thereby rests on holistic distributed execution frameworks and operating systems. Lutz Schubert has given many keynotes and invited talks in the areas of high performance computing and cloud computing, and has contributed to several reports, panels and roadmaps. He furthermore acts as independent expert for the European Commission and as designated rapporteur for the EC Cloud Computing expert working group, which produced the EC’s white paper “The Future of Cloud Computing, the Future of European Cloud Computing” (2010). The expert working group's second report will be published in 2012.